The Book Coco Is Reading Is Bigger Than Her! Perhaps She Bit Off More Than She Can Chew! I know exactly how Coco feels. Here are a few of the books I read which could have used some editing…or not! IQ84– 1186 pages of STRANGE. I actually enjoyed this book…but 1186 pages…come on! Unbroken– only 496 pages? It sure seemed longer than that! A fascinating story, but did we have to hear about every single day at sea? Shantaram– 944 pages. My son made me read it! Really! Pillars of the Earth– 1008 pages…and I loved everyone! 11/22/63– 880 pages. Although it may have dragged a little in the middle….still loved it and did not want it to end! Do you ever feel like you bit off more than you can chew? How long is too long? 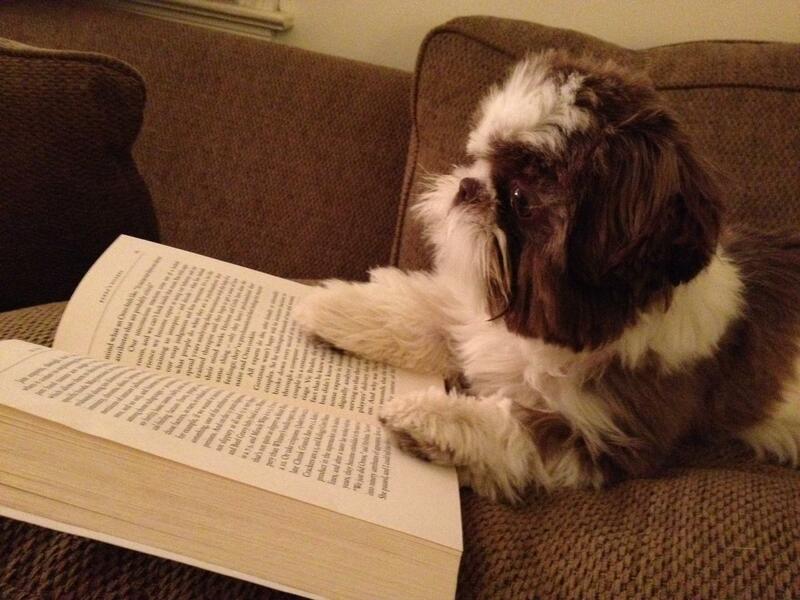 When it comes to reading a book, Coco and I have much in common. I’m still chewing!